The lowriding subculture came together this past December (2003) to help underprivileged children in Brown Pride Car Club�s 5th Annual Christmas Toy Drive. An event devoted to giving back to the neighborhoods we grew up in and continuing the proud lowriding tradition past on from one generation to the next. The historic event took place in the city of Fullerton, and car clubs throughout Southern California came down to support the local car show that�s gaining national attention. 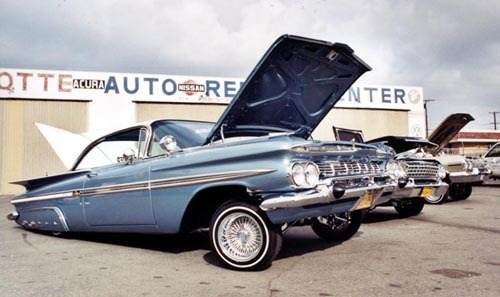 The show featured some of the most world-renowned lowriders such as the classic �Gypsy Rose� from Imperials Car Club. Famed lowrider builder Manual Molina of Brown Pride Car Club revealed his latest automotive masterpiece titled �61 CENTS�, a copper tone Chevy Impala. �61CENTS� was in good company along with Manual Molina�s other lowrider, Lowrider Magazines Traditional Lowrider of the year, �Laylo 58�. This year�s event featured more lowriders and more cars hopping than ever before. Keeping any die-heard lowrider enthusiast pleased with this years turn out, and ready for even more in 2003. Click Here to visit our Lowriding Forum!